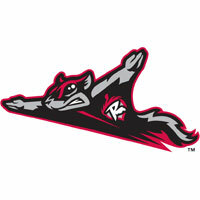 The Richmond Flying Squirrels (67-52) snapped a franchise-record eight-game losing streak with a, 5-1, win over the Portland SeaDogs (74-46) at The Diamond on Friday night. With the win, the Squirrels maintain a 2 ½ game lead on Akron for the division lead. Coupled with a Bowie loss, the Squirrels’ victory increases their padding for a playoff spot to nine games. Left-hander Ryan Bradley pitched well into the fifth inning, and was one out away from posting five scoreless innings. However, Michael Almanzar drilled Bradley’s first pitch over the left-field wall. The solo-home run – Almanzar’s third with Portland – gave the SeaDogs a 1-0 lead. Making a spot-start, Bradley was solid through 4 2/3 innings. He permitted just the lone run on four hits. He walked four and struck out one in his first appearance of the season for Richmond. He did not factor in the decision. Meanwhile, Portland lefty Eduardo Rodriguez (5-7) was dealing through his six innings on the hill. He stymied the Squirrels on just three hits. He did walk three, but also struck out a season-high nine. He left with the lead, but did not factor in the decision. Held without a run for 15 straight innings, the Richmond offense came alive against the Portland bullpen in the seventh. Right-hander Wilfredo Boscan came on in relief and immediately conceded a single to Myles Schroder. Eliezer Zambrano followed and reached on an error. Boscan recorded the first out of the inning, but Skyler Stromsmoe knotted the ballgame with a single into center field. An out later, Mario Lisson worked the count full before blasting a 3-2 breaking-ball for a three-run home run. Lisson’s team-leading 15th of the year was sent to left-center field and gave the Squirrels their first lead of the home stand, 4-1. Right-hander Carlos Alvarado earned the win for the Squirrels. He was excellent across three scoreless innings, earning his first Double-A win. Lefty Steven Okert recorded the final out of the eighth inning and right-hander Hunter Strickland had no trouble in a perfect ninth. Game two of the three-game series is scheduled for 6:05 p.m. on Saturday night at The Diamond. RHP Clayton Blackburn (3-5, 2.81) will make the start for Richmond. Portland has yet to declare a starting pitcher for game two. The Flying Squirrels Pregame Warmup begins at 6:35 p.m. on Sports Radio 910 and SportsRadio910.com.